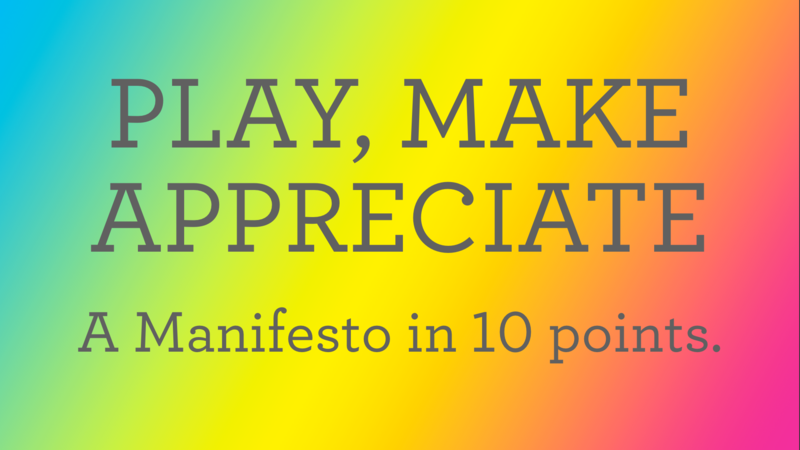 Back in 2014, we gave a talk at the Game Developers Conference Education Summit: “Play, Make, Appreciate: A Manifesto in 10 Points.” It captured our thinking about games education, and how we strive to teach our students at Parsons School of Design. Though we didn’t realize it at the time, this talk served as design values for Games, Design & Play. This issues we raised in this talk, and the solutions captured in the manifesto, guided our writing of the book. This post is transposed from the talk. Let’s cut to the chase. As Colleen and I take stock of games education right now, we see three big problems. This may not seem the case, as many of us teach in and lead thriving programs. We have alums out in all corners of the game industry. All this is true, but just because things appear to be going well doesn’t mean we are on a sustainable course. Other disciplines wrestle with these problems, too. DFW’s essay, “Fictional Futures and the Conspicuously Young” grapples problems in the creative writing MFA. Recommended reading. We’ve formulated games education into one of these two sects: engineering or studio. The engineering model places emphasis on innovating the tools and construction of games, the studio model places emphasis on designing consumable play products. Either way, we’re focused on craft-based skills without fully engaging with how these skills fit into the larger world. Imagine an art program that focuses only on making paintings and perhaps talking about them—or even more, only the finer points of how to use paint brushes and palette knives. Art is not just painting. We’ve largely lost sight of games as the aesthetics of play. We should all seek to find a more holistic approach to helping our students ground their practice as part of culture, and not a product stream, not another insider baseball focus on the sausage factory. We encourage our students to focus on insider aspects of the game industry and not enough on its relationship to the world of culture. Finally, and I say this in front of the most diverse summit at this conference. We need to seek ways to diversify the people who make, play and critique games—more women, more cultural backgrounds, more points of view. In fact, when given the chance to start a game design program at Parsons, we have had to say no. We want to keep games as part of the larger design and technology program. At Parsons, we’re lucky to have one of the most diverse student populations choosing to study games—most of them only after they’ve completed a semester or two of study and have seen how creative games and play can be. We’ve been thinking about all this a lot over the last year or two as we have started work on Art Play, an NEA-funded curricular initiative to integrate games into K-12 arts education. Our approach? Play, Make, Appreciate. So we’re going to share our thinking about this, and then we’d like to have a conversation about how we can start making a more diverse field happen. This is not a “how to” talk. It’s an attempt to recalibrate how we think, about our practice and games education so that we can chart a new course.This manifesto is meant to address these three problems: by opening new pathways to diversity in both students and ideas, expanding the field beyond games as a product, and redefining the study and design of games as a way of understanding ourselves and our time. It is our position that these problems are keeping us from really seeing the value of play outside of games. Yes, games produce play, but many designers tend to see that as an afterthought, not the primary output of our work. And while not everyone sees themselves as a gamer, we are all players, everyone. Play is a tool for making sense of the world. Play is subversive, inconsequential, wasteful, wild, engaged, generous, “an embellishment, a useless, spontaneous, joyous human decoration on the shape of necessity.” (deKoven, The Well Played Game). By looking at what we do through the lens of play – from players’ play to the cultural play that churns around games – we find a game’s soul, not its market share. We encourage us all to embrace play over games, as this is the real special sauce that we produce, not game products. One might ask why such an emphasis on play—many of our students show up with uncountable hours of gameplay time, for example. A certain degree of recalibration is required, though—and not just to get them to stop thinking like players, and more like developers. We need to encourage them to think in a deeper way about play. Play created by games, but also forms of play found beyond games. Just as our media diet needs to be balanced, the games we play should also be varied. We need to try new things, play new games, engage in other forms of play outside games. If we don’t engage with things other than games, we become the ourobouros, a snake, eating our own tail until there’s nothing left. Instead, we need a balanced diet of influences, perspectives and forms. How often do we assign our students games to play? Across genres, platforms? Games without electricity? Sports? Folk games? How about beyond games: Music? Art? Books? Films? Dance? It is crucial that we move beyond a game-centered approach to educating our students. Connecting to the play in everything is an important step in this process. We can model it for our students in our own actions, and how we ask them to approach play and their play experience. One of our roles as game design educators is to make the play visible in culture, and not just games. We may not see the play in other fields such as art, but it’s there. We should be thinking more broadly about our roles as game educators. We should be concerned with more than preparing students for careers in the industry. Beyond making a living, learning how to make a game shows us a way to live life. Making is a form of thinking, and answering questions that can’t always be answered through words. The game design process is one of the deepest investigations into what it means to be human. When we playtest we learn to listen to each other, we find larger truths in the details, we open our minds to alternate ways of doing and understanding. When we iterate we learn a method that helps us manage things that might seem unmanageable, in incremental steps. We learn to listen, to take feedback. Most importantly, we understand failure as a necessary step along the way, and not a stopping point. These lessons are important to making games, but they are also important strategies for life in general. We can help our students see there are many ways to make play and games. Learn how other game-makers work. You’ll be surprised how different it can be. Connect with other making communities, share ideas and work with other design disciplines on game-based projects. Learn the iterative methods of other fields, and by utilizing those methods, they help us innovate our own. Learn the research methods of other fields. The more we open ourselves to other kinds of making, the more paths we will see for making better games and play experiences. I think many of the formerly robust social game companies are learning this lesson. let’s focus on what the game lets people do, instead of focusing on what the game market is. Not how it will be marketed and sold, but on the kind of experience it will provide. Product-driven thinking leads to an over-emphasis on genre, and micro-innovations that don’t advance games in the diverse ways it should. We know that the notion of market may not be what you focus on in your programs, but even assuming that there will be a market—one that continues to grow—is assuming that people will continue to find value in games after they’ve played their 10th clone. The more we design with people in mind, the more likely we are to produce games for a more diverse population. We need to see the bigger picture, socially and culturally, to connect games to life. We need play appreciation courses to sit alongside music and art and film appreciation. And if we are so lucky, Games Criticism and Analysis courses too. Not everyone who studies art, music or film goes on to make. And that is OK. We promote the idea of game design as a liberal art, not a vocational discipline. We need more critical voices. We need to design courses that attract people from other disciplines to take our courses. That suggests that we need to show our students how to play, make and appreciate. And how to do these things critically. as the famous educator bell hooks said, “critical interrogation is not the same as dismissal” bell hooks’ Teaching to Transgress is another recommended reading. In fact, if we cheerlead too much for our field and our form, we aren’t helping it become more open and diverse. Of course students, and we all need to think formally about our games, and how they are not working from a technical and design perspective. But we also need to understand how they fit into culture more broadly. What our games say, or better yet, what our games do. Games do. They’re generative. They generate play, they generate opinions, emotions, and ultimately culture. What kind of culture does League of Legends generate? Tekken vs. Streetfighter? The Sims? College Basketball? Evoke? We often narrow our critical scope to the systems inside games and forget the broader social systems games create and are part of. Finally, Connect games to life. This is the bottom line. We have gone so far down the rabbit hole of games as a product, of a hyper-formalist and market-driven consideration of games that we’ve lost sight of a fact some 8,000 years old. Games are part of culture. Games create culture. The context and ecology for games are not a given. They’re created by US. For all kinds of people. In our work as educators, the more we can help people realize how important play is to life, and that games are the medium of play, the better off we’ll be.